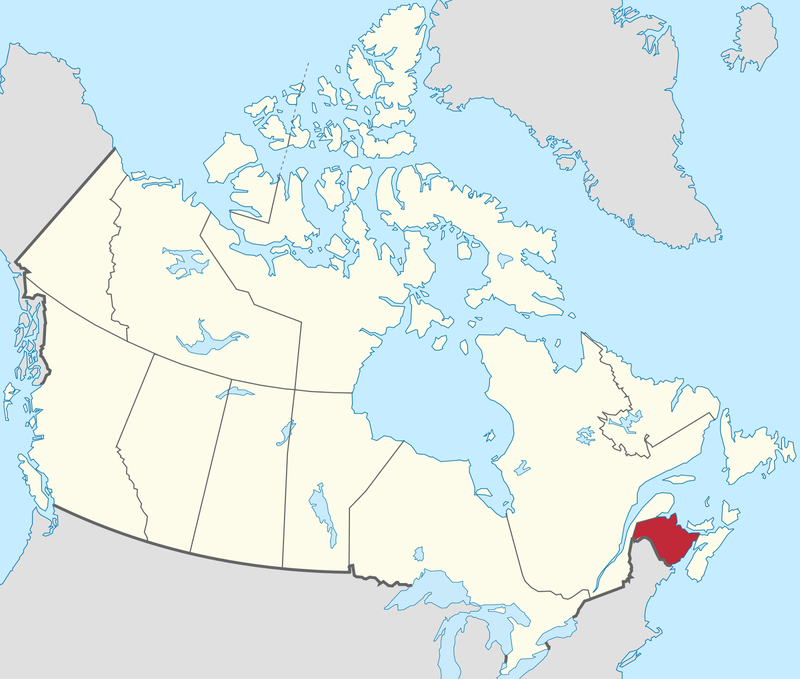 New Brunswick has a total population of about 750,000 people. The largest city is St. John with a population of about 75,000. The greater St. John area is about 127,000. But when the tide comes in twice a day, Ruth would be under water! And so would all of these people! 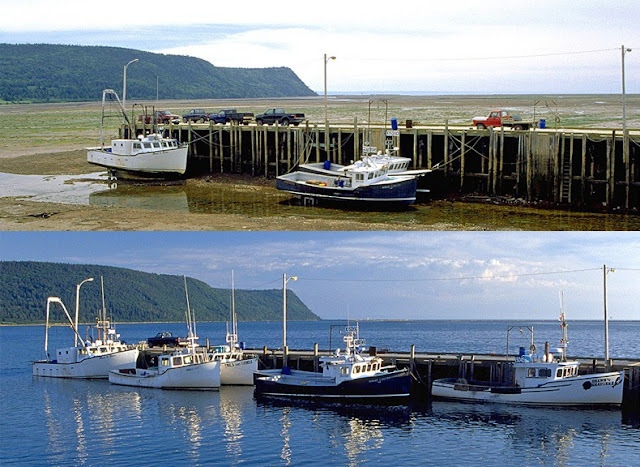 And, the highest tides in the world are at the Bay of Fundy which separates New Brunswick and Nova Scotia. The water can rise as much as 50 feet! As much as a five story building! It takes only six hours for the water to go from low tide to high tide. As I said, New Brunswick is a province that we need to spend more time. One of these years we will take an RV trip to Newfoundland and include a little more time in New Brunswick along the way! Next up... Prince Edward Island. We have actually spent more time on the two coastlines in New Brunswick but very little time in the interior of the province. We are going to have to fix that one of these days. I read a lady's blog called Of Pedals and Wool. She lives near St. John. I love to read her blog about change of seasons including winter and flooding in spring. Her flower beds are beautiful. I have a diary farm and she shows pictures of calves being born, her barn, etc. Love her blog. This lady sounds a lot like one of Kevin's cousins that lives in British Columbia, except instead of cows, she has horses and beautiful gardens. just as long as you don't have a Diary-A farm all is well. So many interesting things to see and do in New Brunswick, I explored most of the province one a few years back in the 1970's. so beautiful. Glad that you have gotten there and explored it! You need to get out again in your motorhome and visit more of Canada once again. I remember you and Suzie planning drive out west a couple of years ago before turning the coach south unfortunately that got put on the back burner because of necessary repairs to your coach but you haven't mentioned about rescheduling it since then. Just like your photo. Northern coast of Spain has lots of erosion. Big tourist spot. Cathedral beach. Guess we are going to have to go and check out the Northern coast of Spain next time we head to Europe. It is actually on our list of places to visit anyways, seeing that we only got to see a small part of Spain in January and February this year. We've only followed the southern coastline, like many people. Right now, Jimmy and I are looking at traveling up NB's eastern coast to the Gaspe Peninsula and follow the Seaway into Quebec or down into Maine. I hope we don't get into trouble w/o knowing more than two words in French. I know, the province and its people are bilingual. Have you and Kevin been into the Gaspe? Yes, we have been to up along the eastern shore of New Brunswick and then crossed over into Quebec and up and around the Gaspe Peninsula and then along the St. Lawrence Seaway into Quebec City. We did that back in August 2008. You shouldn't have any problem with the language in New Brunswick, it will be a little more difficult in Quebe. Just try your best along with a lot of smiling and hand gestures. In the bigger towns you will find people that can speak English out in the country it might be a little harder. The scenery on the Peninsula is beautiful and along the seaway. Thank you! It's in the plan for next year. That would be the "tentative plan!"